There are a good number of educational programming environments available now. We sat down to compare three of the most successful ones: Greenfoot, Scratch and Alice. When talking to the development teams of Alice and Scratch, we noticed that we were all getting these same questions with increased frequency. So we sat down to compare and contrast, and explain where there might be crossover points. The panel sessions were very popular, and we received many follow-on questions. We decided to produce a written version of this discussion, which was published as a special issue of the ACM Transactions of Computing Education (TOCE). This issue consists of a set of papers. One paper each was written by a key member of the design team of each of the environments, describing their system and putting it into context with the others. In addition, the papers include a more general introduction to the relevant topics and a discussion between the designers. Note: All of the papers are in the ACM digital library, here. Some of them are also downloadable directly from the authors’ web sites. These are linked to the full text in the list above. After the success of the Greenroom, a sister site has now opened: The Blueroom. The Blueroom is the educator community site for BlueJ users. Many Greenfoot users may know BlueJ, another educational programming environment developed by the Programming Education group at the University of Kent. BlueJ, as a piece of software, is older than Greenfoot, but has never had a community site equivalent to the Greenroom. Feedback requests will start appearing on the index page for users that have downloaded resources over a month before. We hope this will encourage more user feedback on resources. As Michael talked about here, some of you will start noticing a popup on the index page requesting your feedback on any resources you downloaded a month before. This only started from the 1st of April. We hope that this will encourage you to leave more feedback. This is invaluable for both users and maintainers of the resources. For the users it provides information on what people thought of it and hopefully examples of use in classrooms or as assessments. For the maintainers it can provide suggestions as well as gratitude. We also want feedback on our feedback system, so please respond in this discussion what you think of it and any thoughts or suggestions you might have for it. A new tutorial video is available that explains how to implement a shooting action in Greenfoot. Shooting - firing some kind of object at some other kind of object - is an element in many games. How to implement this in Greenfoot is a regularly posed question. 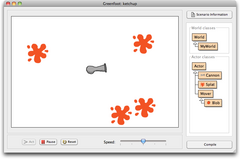 To answer this question, a tutorial video is now available that shows how to create a ketchup cannon – a cannon that fires blobs of ketchup into the world. The video is 22 minutes long. It is available on YouTube and - in better quality - on the Greenfoot web site, here. You can view the video in your browser or right-click the link and download it to view it locally. Over the last couple of months, the Greenfoot Gallery has seen a significant overhaul, with plenty of new features. The Greenfoot Gallery, the place where Greenfoot users can upload and discuss their scenarios, was opened about three years ago, and had not seen a lot of changes since then. More recently, it has received some overdue attention and a number of important improvements. The most obvious one is the inclusion of a discussion section. General Greenfoot discussion used to take place on the Greenfoot Discuss Google group, splitting the user community in half, with the Gallery for discussion of scenarios and the Google group for everything else. At the beginning of March, the two halves were brought together under one roof with the movement of the Greenfoot discussion forum to the Gallery site. Other new features include personalised notifications of interesting content (such as comments on your scenarios or replies to your discussion topics), optional email alerts, an RSS feed for the discussions, a more varied display of popular scenarios and improved visual design. The improvements are not yet finished, and more will be coming over the next few weeks. The most significant development will be the merging of greenfoot.org and greenfootgallery.org into a single web site. 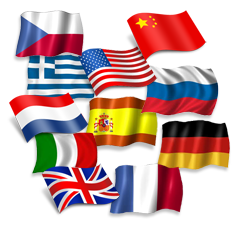 The Greenfoot software is now available in 10 different natural languages, thanks to community efforts and volunteers who have provided translations. Greenfoot has – from the very start – been designed so that the interface can very easily be translated into other languages. It is mostly a matter if finding and duplicating a simple text file (‘greenfoot-labels’) that contains all the text strings that are visible in the interface, and translating them into another language. Usually, this adds up to just a few hours of work. The real problem, thus, was not to find the time for the work, but to find people able to speak each of the target languages. And here we see once again the power of community and collaboration: Over the past few years, a number of groups and individuals have stepped forward, translated he interface (and sometimes the tutorial too!) and contributed it back to us. Tell us if you want to make another translation. We can tell you how - it’s easy. The Kinect software for working with Greenfoot and the Kinect has been updated. The new version is faster, better (it tracks user outlines properly) and now copes properly with the sensor going to sleep. 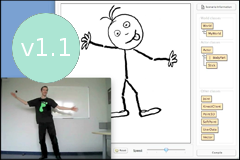 We’ve just released version 1.1 of the Kinect software for Greenfoot. You can install the new version on Windows just by downloading the new executable, or on Ubuntu by downloading the source and rebuilding. We hope to provide a proper Mac OS X release in the next week or two. If you’ve already started a Greenfoot Kinect scenario with version 1.0, follow the instructions at the end of the examples page to update your Greenfoot scenario with the latest client software. This new software has several changes in it. One is that user outlines are properly tracked. Previously, due to a bug, the user’s outline was not accurate where there were gaps in the image (e.g. between the arms and body, or between the legs), but this has now been fixed. The software used to not be able to properly restart the sensor if it went to sleep after a long period (hours) of being idle, but this has also been fixed. Additionally, the software has been optimised which should help it to run better on slower CPUs. 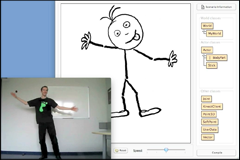 The library to program Greenfoot scenarios with the Kinect module is now available. Watch a short video here, and find out the details. The Microsoft Kinect is a sensor module, including depth-sensing cameras, that can track movements of people in a room. It was originally developed by Microsoft for the Xbox 360 games console, but it can also be connected to a standard PC or laptop via a USB connection. Writing programs yourself with the Kinect is incredibly good fun. Games and other scenarios can be written that are controlled by users running, jumping or simply moving their arms around. If you are looking to get students excited (or, to be honest: get excited about programming yourself), using the Kinect as a motivator is a very promising approach. By combining a physical element to the program running on screen, computing acquires a new dimension which can often get kids engaged that otherwise don’t relate to programming. To get an idea of the potential, you may like to watch the following short video. We have now released the libraries and documentation needed to program the Kinect with Greenfoot. All software and documentation is available here. If you do experiment with this (or even use it in a classroom) please report back to us. Experience reports would be very welcome! An introductory Greenfoot workshop will be offered on 15 April 2011 at the CCSCNE 2011 Conference, held at the Western New England College, Springfield, MA, USA. The conference is held annually by the Consortium for Computing Sciences in Colleges and offers a two day programme for computing teachers. The Greenfoot workshop will be led by the Greenfoot Hub leaders of the New York and New Jersey hubs, Adrienne Decker & Fran Trees. You can find more detailed information on the Greenfoot Hub web page. Feel free to contact Adrienne or Fran if you have questions. The Greenfoot News announcements are now also available via RSS. Those of you who like to get their news delivered straight to your inbox, either in your mail client or any other favourite RSS reader, can now do so by subscribing to the Greenfoot News RSS feed. 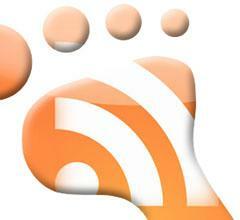 If you are an RSS user, then sign up and stay up to date with what’s going on with Greenfoot. 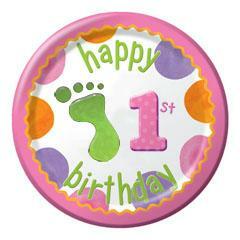 The Greenroom turns one. In late March 2010, the Greenroom was officially opened to the public. A year on, we have more than 100 resources and over 1,000 members. Let’s all raise a glass and have a drink in celebration. It has been going incredibly well so far, with many people joining in, interesting discussions and many useful resources submitted. We, the Greenfoot Team, would like to thank everyone who has helped making this a lively place, by asking questions, offering advice, contributing to resources, etc. Please keep it up. To a successful second year! The Microsoft Kinect™ module, a body tracking sensor developed originally for the Xbox game console, is fast becoming one of the most popular gaming devices. Now it’s become easy to program—with Greenfoot. The Kinect module can be easily connected to any PC or laptop with a standard USB connector. The Greenfoot team has recently worked on connecting the Kinect to Greenfoot. The result is a Greenfoot library that makes it incredibly easy to write Greenfoot scenarios that use the Kinect sensor input. Scenarios can include anything from games that react to the users movements in the room (such as jumping, reaching, running) to artistic projects. The library can track multiple users at the same time. The potential is endless. The Kinect hardware includes a camera, and the Greenfoot/Kinect library gives easy access within Greenfoot scenarios to the location (that is: x,y coordinates) of the joints of bodies within the view of the module. Head, shoulders, elbows, hips, knees and feet are all tracked and can easily be monitored. The libraries will be released publicly by mid April. Until then, you can see a brief demo video to get an impression what it may look like. In this short video, Neil Brown, developer of the Greenfoot/Kinect library, shows how to paint by doing nothing more than waiving your hands in the air. Several Greenfoot events took place last week at the SIGCSE 2011 conference in Dallas, Texas, including a popular Greenfoot Breakfast with information and demos of new Greenfoot developments. The Greenfoot Breakfast Club, as the early Saturday morning event was titled, required dedication to attend: a starting time of 7:00 am meant it was not aimed at night owls and late risers. However, a large crowd braved the early morning starting time and attended an hour full of information about recent Greenfoot developments and demos of a variety of Greenfoot technologies. Ian Utting gave an introduction to the Greenfoot system, followed by a run through a variety of features newly added to the Greenfoot environment over the last year. These included the new editor features introduced in Greenfoot 2.0, such as code completion and syntax highlighting. 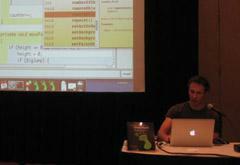 These were demonstrated by Davin McCall, the leading developer on the new editor implementation project. Among the most popular new additions to Greenfoot was announcement of support for a variety of hardware devices. These include support for Pico boards, Gamepads, the Finch robot and the Microsoft Kinect. Pico boards are inexpensive sensor boards developed at MIT for use with the Scratch environment. They contain a number of sensors which can now be accessed easily from Greenfoot through a custom built library. A demo scenario to get started with Pico boards is available now. Gamepads, controllers for popular games consoles such as the Nintendo Playstation and the Microsoft Xbox, are especially attractive to use because they are ubiquitous and cheap. Many students will have a controller at home, which can also be plugged in to a PC or laptop via a USB connector. 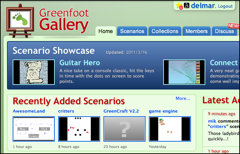 Several demo scenarios and a project template are now available on the Greenfoot web site showing how to use a standard game controller to play Greenfoot games. Connecting robots to Greenfoot was shown with the Finch robot, a small affordable robot designed for use in computer science education. The Finch can be programmed to move around the room, detect light, temperature and obstacles, and even has an accelerometer. Greenfoot sample scenarios and project templates are available now. Possibly most excitement at the breakfast event was created by the Kinect demo, presented by Neil Brown. The Kinect is a sensor device developed by Microsoft for the Xbox games console. It can track movements of a human body, allowing users to control their programs by moving their arms and legs, jumping, running, or any other physical movement. 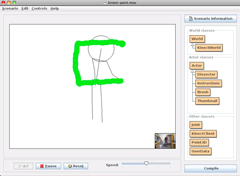 Neil demonstrated a simple Greenfoot scenario that lets user paint on the screen using nothing but waving their hands in the air. The Greenfoot Kinect library will be published shortly. The breakfast event concluded with an introduction of five of the Greenfoot Hubs leaders, who presented their current activities (schedule available here) and gave audience members a chance to talk to them afterwards. Other Greenfoot events at SIGCSE included two workshops, one for Greenfoot beginners and a second one aimed at producing Greenfoot teaching material. Hub number 5 on our list of Greenfoot Hubs is Atlanta, with its Hub Leader Thomas Cooper, Computer Science Department Chair at the Walker School in Marietta, Georgia. Thomas teachers Introduction to computer science, in Python, and Games and Simulations, using Greenfoot and Java. In addition, he teaches Outdoor Culture and Technology (KML and Expedition History), an AP Computer Science class, and serves at the Technology Integration Coordinator for the school. Thomas is the faculty sponsor for the school’s VEX robotics team and the faculty sponsor for the Outdoor Adventure Club. He is also currently serving at the GaCSTA Vice-President. Having been involved with teaching programming for the past 2 years, this is Thomas’ first year teaching AP Computer Science. He encountered Greenfoot about 2 years ago when he was doing research for the school’s intermediate programming course. Thomas was first considering another system but changed his mind when he came across Greenfoot. Another initiative Thomas is working on is an online collaborative programming project he is doing with APCS students from different schools in the SE region. He is using Google Tools, JavaWIDE and Elluminate to program fractals using recursion. The tools allow students to work together, record their programming sessions, and talk together in small groups for brainstorming and problem solving. 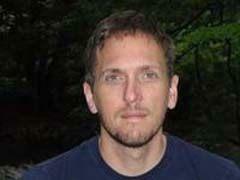 Thomas enjoys camping, hiking, kayaking and caving. He has a Shepard/Lab mix named Ginger, who he takes with him on trips whenever he can. He is trying to visit a national park each year in his quest to visit all 54 parks in the US. Today we introduce Fran Trees, from Drew University, leader of the New Jersey Greenfoot Hub. Fran has been teaching mathematics and computer science at Drew University in Madison, New Jersey, USA since 2001. She primarily teaches introductory programming courses and has integrated Greenfoot into these courses. Prior to Drew, she taught computer science and mathematics at the high school level. Her research interest, pedagogical tools used in introductory programming classes, was the impetus for playing with, and teaching with, Greenfoot. Fran is actively involved with the Advanced Placement Computer Science program and has conducted AP CS teacher workshops and institutes for many years. She is also Chapter Liaison for the Computer Science Teacher’s Association (CSTA), where she promotes CS education and professional development to various local CS communities. 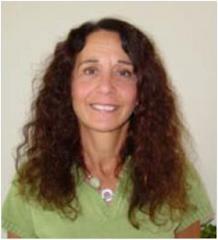 When not teaching programming, Fran teaches SCUBA diving and enjoys running, biking, swimming, and skiing. She lives in northern New Jersey with her best friend (and cohort in all of these activities) and their four cats and two tropical fish (one of which is 14 years old). Plans for the New Jersey Hub this year include after school workshops for local teachers and a workshop (in conjunction with the New York Hub) at the CCSC NE conference, April 15-16, in Springfield, MA. See the New Jersey Hub page for full details!